Archeologists dig through rubble searching for artifacts to help them interpret the history of the communities they uncover. How will tomorrow’s archeologists interpret today’s history when they uncover the rubble of the wall between the United States and Mexico? Will they conclude that people on either side must have been great enemies? Will they write that there must have been a war so hostile that thirty-foot columns of rebar, concrete, and steel were needed for fortification? Will they assert that a deadly plague must have required isolation? Will they wonder if the wall was built to prevent people in the north from escaping? What will the future think of us? Recent policy changes on immigration are staggering. Policy, especially policy that could truly harm people, must be the result of a careful and thoughtful analysis of its needs and its consequences. Instead, right now we experience lurching and radical changes without care to the human beings whose lives are being destroyed. 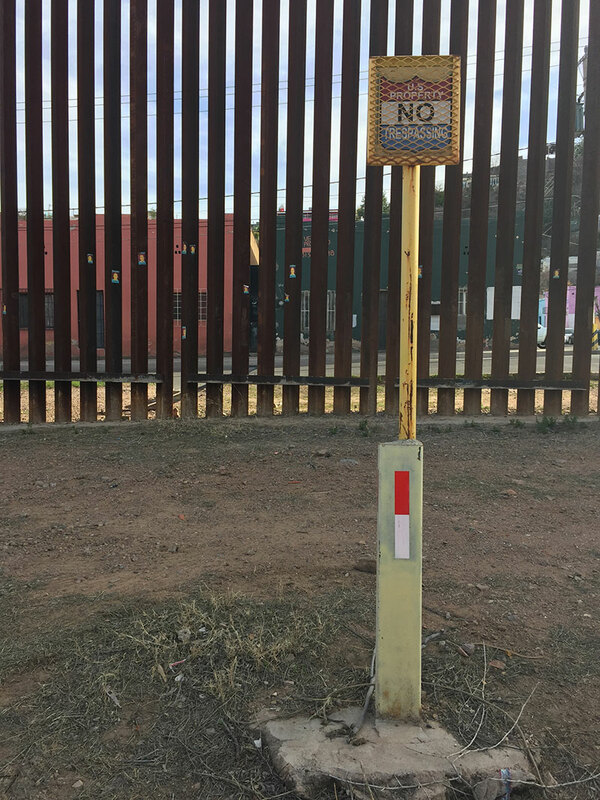 For spring break Associate Professor Sherrie Kossoudji and the students in SSW 799 travel to the border to witness, experience, record, and reflect upon U.S. border enforcement in the Tucson/Nogales area. 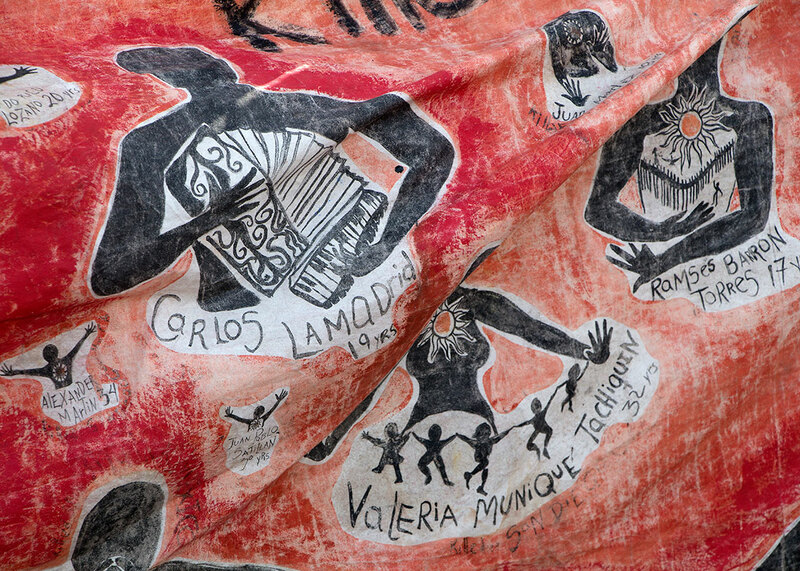 The goal of Contested Borders: Policy on the Ground is to understand the nuances of our policy by observing the day-to-day activities that constitute the minutiae of a policy’s impact on the people who migrate, the people who enforce the policy, and the communities that surround the border. 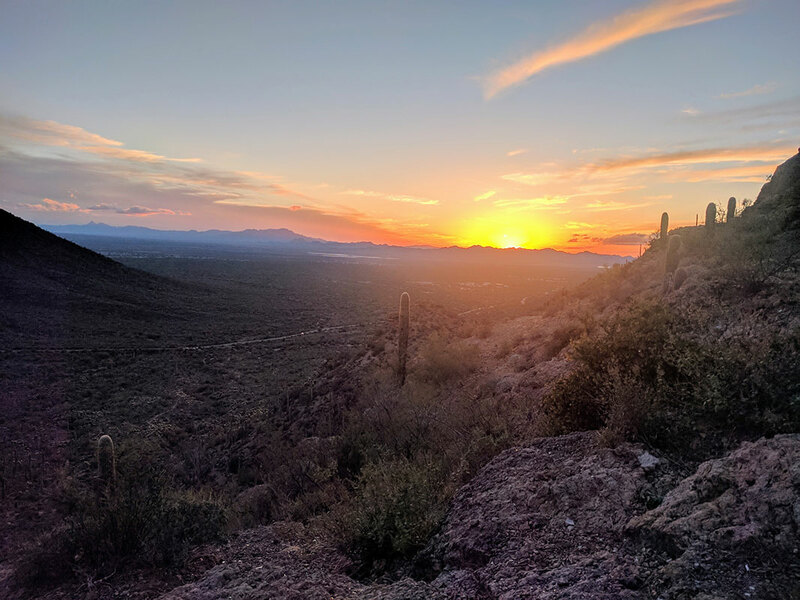 Sunset in Gates Pass, Tucson. 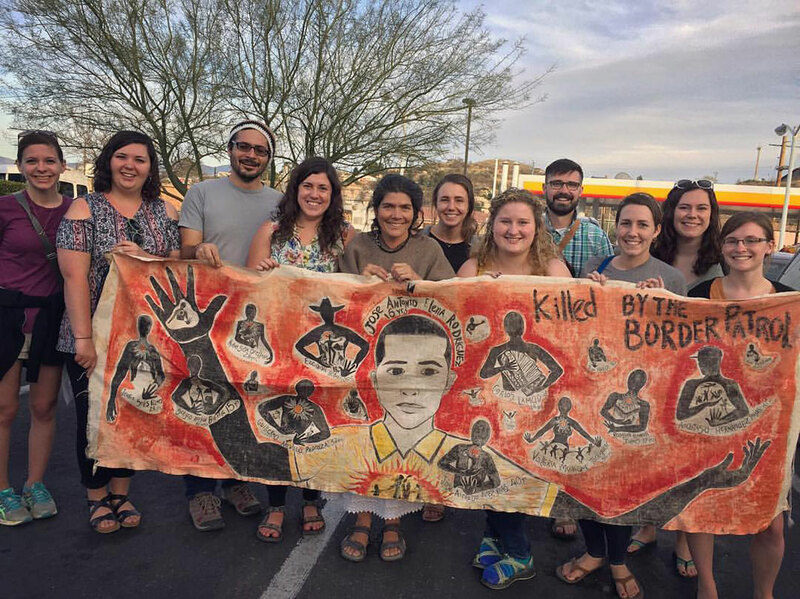 Heading back to Ann Arbor after visiting Tucson and Nogales and learning about the conflicts and tensions that populate the political life of the borderlands is an intense, almost surreal change. One does not need to read in between the lines in order to sense the contradictions and hidden agendas of border policies. It is true that throughout this travel seminar these contradictions have screamed in front of our eyes. But what I have found most puzzling is how divergent are the responses to these contradictions by those who call the borderlands their home. 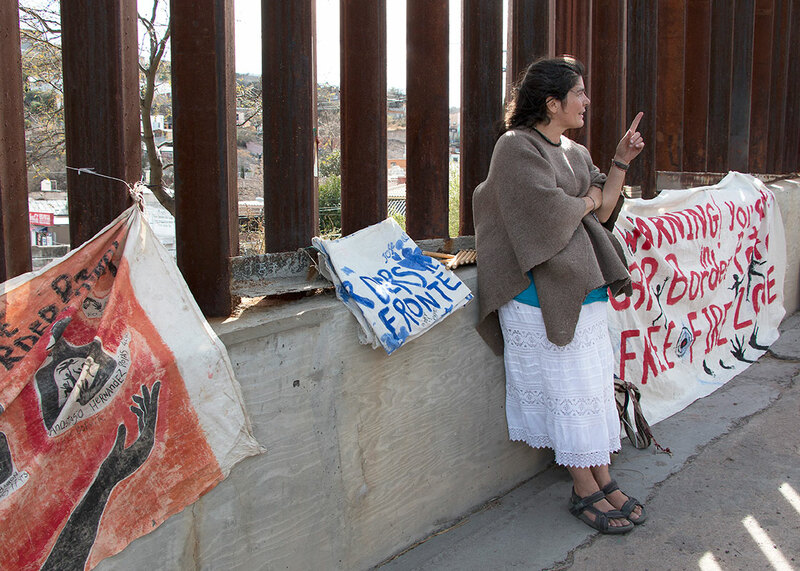 The activists we met in Tucson’s Peace Fair, the Samaritans volunteers and Ana Maria, to name a few, embraced and engaged these contradictions very openly. They are unafraid to advocate for criminalized migrants, point out unjust and violent laws and openly engage in humanitarian aid and advocacy. In pursuing their passion for social justice and for the equality of all men and women beyond national borders, they have shared with the courage to continue their work despite the contentious attention that their work attracts and the very risk of retributions by those who oppose their mission. These activists have become for me examples of what a life ethos based on the resistance against injustice and oppression entails. On the other hand, many of the people we met were able to compartmentalize away from their lives and sense of self the violence and injustice that their actions reproduce. 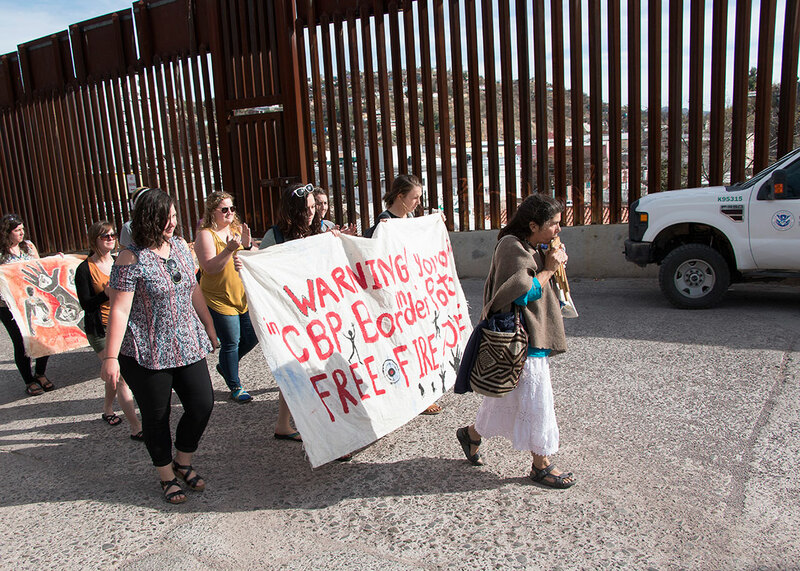 Tucson Magistrate Judge Lynnette C. Kimmins and the border patrol agents we met in Nogales, for instance, demonstrated a disconnect with (hopefully not a lack of knowledge) the systems of oppression that connect U.S. economics to a long history of violence and exploitation in Mexico and Central America. I do not argue that this compartmentalization makes theses individuals inherently evil or corrupt, for they might not have had the opportunity to reflect upon and articulate the consequences of their actions as seen from the perspective of those affected by such actions. Instead, as Hannah Arendt argues in Eichmann in Jerusalem: A Report on the Banality of Evil, I posit that evil expresses itself not as an iron-branded character flaw but as the naturalized oversight of the consequences of our actions, in other words, as the taking-for-granted of the rationales that we intuitively formulate but rarely articulate for our own actions. I find Arendt’s notion of the banality of evil particularly useful to understand the evil created by the de-personalized and bureaucratized actions of U.S. government officials along the border. Arendt’s work had become increasingly poignant in our times, when we have become so quick to point the “other” as that who makes us unsafe, instead of pursuing a thorough understanding of what makes us safe and why those we believe make us unsafe do so in the first place. Those that argue that our government’s actions are justified and that undocumented migrants deserve to be criminalized have missed (or deliberately chosen to ignore) the fact that our laws do not allow for the poor and marginalized of other latitudes to make an argument as to why they should be given a chance to pursue better survival opportunities inside the US. This contradiction becomes ever more ironic when their poverty and powerlessness, as demonstrated in the case of Central American immigrants, is a direct result of US-funded wars and imperialist interventions in their home countries. Our historical myopia so easily leads us to ignore the lasting effects of U.S. imperialism, which since the 19th century, when William Walker established mercenary forces to annex parts of Mexico and Central America into the U.S., has attempted to subjugate foreign lands and peoples to the interests of the economy (particularly of the select elite that controls it). 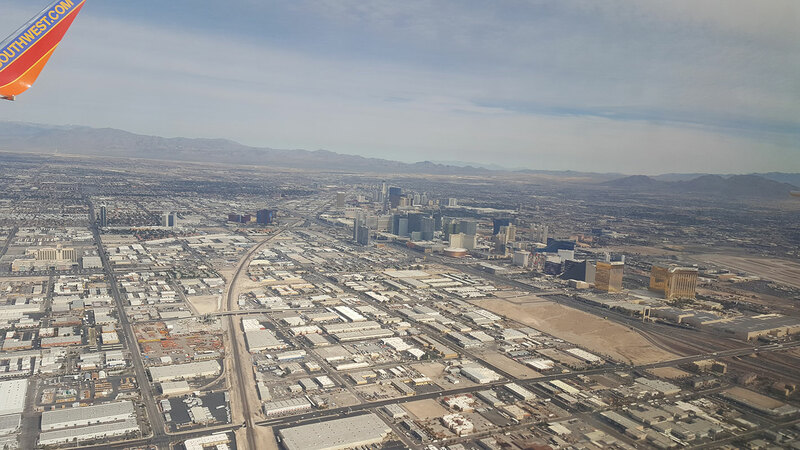 This travel seminar was a head-spinning experience that taught me a great deal and helped me rearticulate some thoughts about the origins and inner workings of the systems of inequalities that plague our nation. Along with knowledge and experiences, this travel seminar has renewed in me the necessary energy to fight for a world in which, to paraphrase Dr. King, a person ought not be judged by their skin color, passport, or citizenship status but by the content of their character and the outcome of their actions. I would recommend this experience to anyone willing to step up to the edge of their own identities in order to gain further understanding of what makes our exclusionary, racist, xenophobic immigration system tick. Video of our group approaching the border wall/cattle fence in the edge of Coronado National Forest, east of Nogales, AZ. An overwhelming theme during this week has been resilience. After such a powerful week, I am reminded of the incredible resilience it takes for men, women, and children to migrate to the United States. So often with the current events in this country, it feels as if all humanity has been stripped from our immigrant community, specifically those who migrate north without proper documentation. I witnessed time and time again, the incredible worth, strength, and resilience of those whose desires are no different than my own, yet who have been and continue to be oppressed by a system that claims otherwise. This week I found myself looking at the system as a whole throughout each of our days. I am stricken by how separate and disjointed our immigration system is. Time and time again I heard various people tell us something along the lines of “another department handles those affairs, and we do not know what they do.” From border patrol agents, to the federal judge I was shocked to continually hear this message. A system of many departments and working parts cannot effectively operate in anything but collaboration. As players in this system, we all have a role. The system is guilty of criminalizing another human for seeking safety and refuge—a greater life in the land up north. As one samaritan shared, “Once I had awareness of the issue, I had a choice to make.” Within this system some are selected to play a role of complacency, to not question the system or challenge ideas. As a witness, lacking action, we are still playing the role of complacency, thus the side of the oppressor. As I travel back to Michigan, I have a choice to make. I’ll be asked “How was your trip?” more times than I can imagine, and in thirty to sixty seconds, I have the opportunity to make another person aware. In my days following, I have a choice to make—To set up and take action, or remain complacent in the system. The system needs to change. And it must start now. Fear is powerful. Fear is dangerous. Fear is protective. Fear is strong. I’ve thought a lot about fear this week. When I think about the current political rhetoric, specifically Trump’s comments and policy on immigration, I see the way it is driven by fear, with blatant disregard for logic, data and truth. We are human; we fear what we don’t know, what we don’t understand, what we can’t fit into the boxes in our head. If only the people pushing the anti-immigrant and anti-refugee movement could sit across the table and break bread with someone who has made the decision to flee their home, carrying a backpack of belongings and children on their backs. Many of the migrants are fleeing their homes because they fear for their life, having been threatened by cartels or gangs. Some fear that they don’t have the economic opportunity to support their families. I think back to the moment we emerged from the trail after our hike on Wednesday. A border patrol agent was waiting for us. He looked at us, and said, “I’m surprised you hiked back there. Weren’t you scared?” When we asked why, he said “people with guns.” He was trying to scare us, or maybe he truly believed it, having been fed the false narrative that migrants are dangerous criminals. 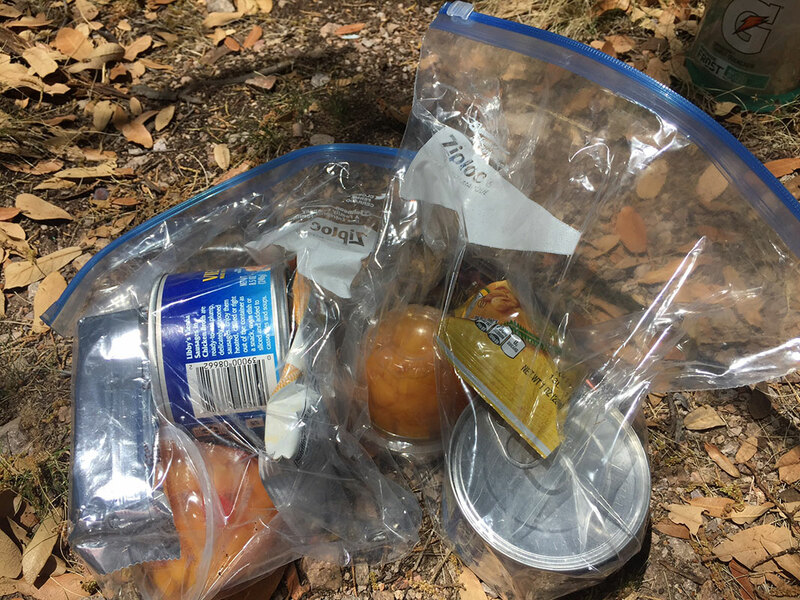 Our guide has been hiking the migrant trails to leave food and water for 12 years. He has never felt threatened. Threatened by who? By the people – men, women, and children – who are literally fleeing violence, who are risking their lives for freedom and safety? 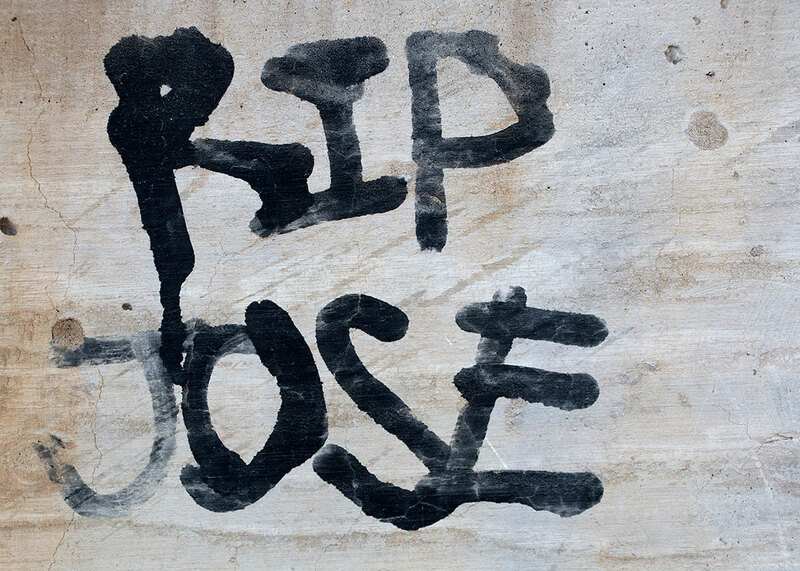 46 people have been killed by border patrol since 2010. Often because the agent says that they feared for their life. 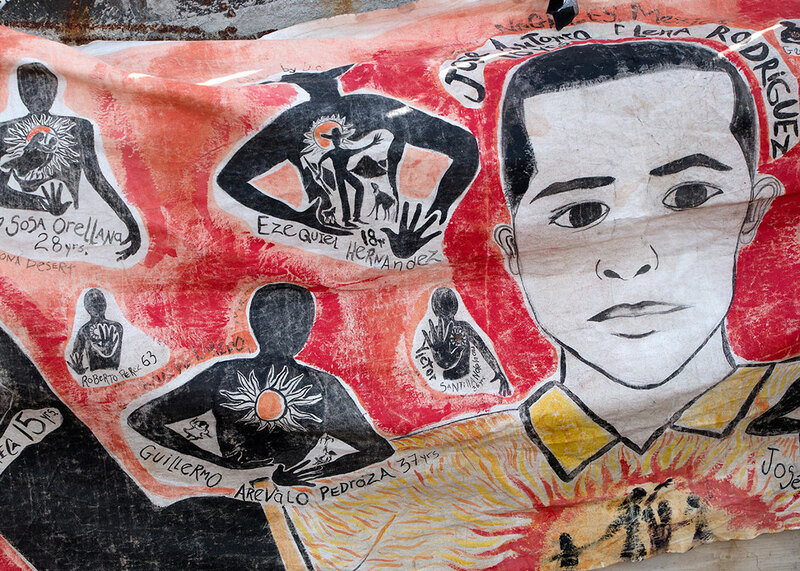 The militarization of the border has led to a killing spree of innocent, unarmed human beings. The more you know, the less you fear. So, let’s have conversations. Let’s feed each other and care for each other. And then let’s make a choice. We cannot let fear build more walls on this land and in our hearts. Guess what? The world kept going while we were at the border. Over the weekend of February 25-26, major stories came out in the New York Times and Washington Post about the effects changes in immigration policy are having on undocumented workers and families. Robert Samuels with the Post wrote that in immigrant neighborhoods businesses are empty and children have stopped going to the park. On Tuesday during President Trump’s address to a joint session of Congress (what will, in future years, be called the State of the Union Address), he outlined a new office under the Department of Homeland Security, which will work with victims of crimes committed by undocumented immigrants. Despite studies showing that immigrants are less likely to commit violent crimes, Trump used these very rare cases to scapegoat immigrants and create fear in the voters during his campaign. Now it appears the administration is going to continue to benefit off people's’ fears, and continue to ignore the violence truly going on at the border by inhumane policies, prevention through deterrence, and outright killings by border patrol. Daniela Vargas was detained by Immigration and Customs Enforcement (ICE) on Wednesday after speaking out about her father’s and brother’s detainment two weeks prior. She had Deferred Action for Childhood Arrivals status, which had temporarily lapsed, but she was in the process of re-applying. She was not involved in a crime. This is the most blatant example of retaliation we’ve seen from ICE so far. On Friday, a story from Portland, Oregon gained national attention; a judge had an undocumented man charged with a DUI leave her courtroom through her private entrance in order to avoid ICE agents who were waiting for him in the hallway. She received criticism for this, though received no formal charges, and unfortunately the man was detained two weeks later at another court hearing. The experience we had in Arizona was impactful. We can read about the human rights violations and difficult journeys immigrants make in search of a better life. However, meeting with border patrol, and talking with families who are visiting each other through the border wall, or who spend hours every day waiting in line to take their children to better schools really made these stories hit home. I appreciate my colleagues and my professor for their commitment to ending inhumane border policies and alleviating some of the struggles of immigrants. I appreciate their commitment to doing this work in ethical ways that account for our privilege as (mostly) white, highly educated, and with legal status in the U.S. Injustice doesn’t stop. There is more work to be done. This statement made by our wonderful Samaritans guide on Wednesday has been playing over and over in my head. I have seen and listened to and, in the smallest ways, felt the hardship – and the hope – at the border. Reflecting on the week, I find myself with a greater awareness of even more of the challenges and complexities in what I already knew to be a heavily complicated system. And now I have a choice – to tuck this knowledge away and let the 2000 miles between me and Nogales swallow up the truths I’ve seen. Or to move forward, to take action, to raise awareness of what is happening along our southern border, and to support the incredible, tireless work for justice that is already in motion. It might not surprise you that I feel quite committed to the latter. 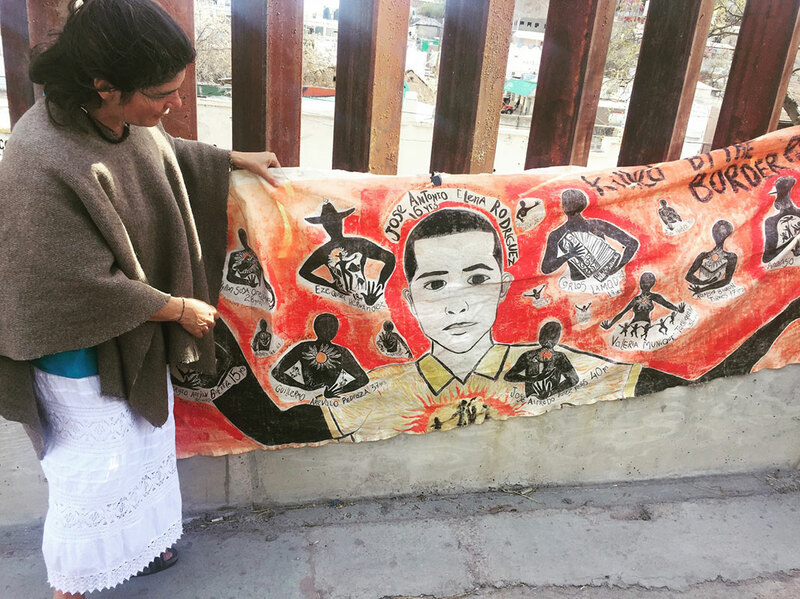 Yesterday, standing at the border fence looking down to the spot where José Antonio was killed, Ana María unfurled a well-loved cloth banner covered with bright blue paint. 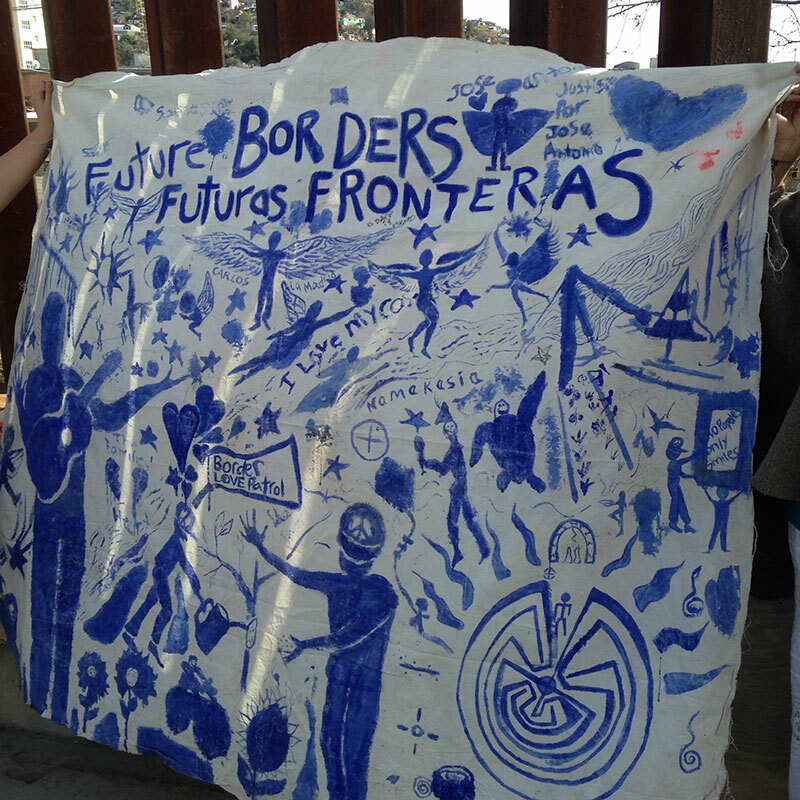 Along the top were the words “Future Borders – Futuras Fronteras.” Ana María explained that she had gotten together with some children and youth who live along the border to imagine how the place where they live could be different. Some of the depictions are perhaps what you’d expect – a swing set, a park, trees and flowers all around. But as Ana María continued to explain their creation, I had that familiar feeling of appreciation for the genuine insight and ingenuity of children that never fails to amaze me. 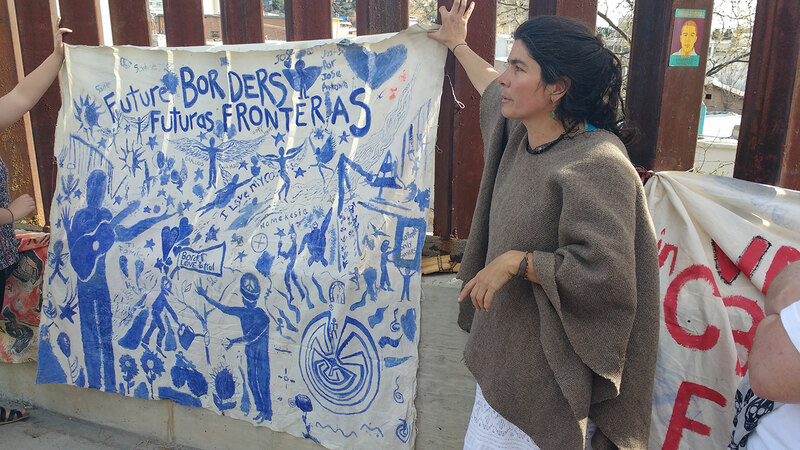 “Here, it says ‘Border Love Patrol,’” Ana María explained, “because the children don’t want the agents to be without a job. 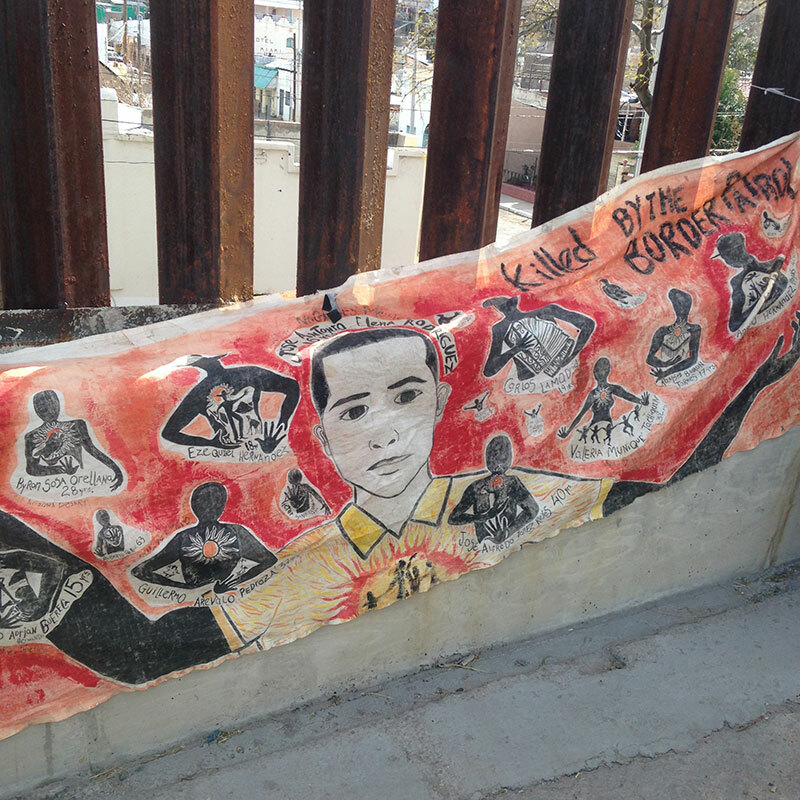 Instead, they want the patrol caring for the garden, making sure everyone is safe, and loving everyone.” These children’s vision for their ideal border did not punish or cut out the border patrol agents who, a week ago, I was ready to dump all my rage upon. Their vision asked for justice, but didn’t discriminate or exclude; it made a place for everyone, in a peaceful, loving, beautiful space. So what else is there to say? There’s a lot of work to be done. “When you get tired, remember the faces of the little ones. They are our bosses,” Ana María reminded us. I’m thankful to carry with me their vision along with so many other perspectives I’ve been awakened to this week. It was not until halfway into our second plane ride back to Michigan did I fully begin to process the experience that now seems so surreal. 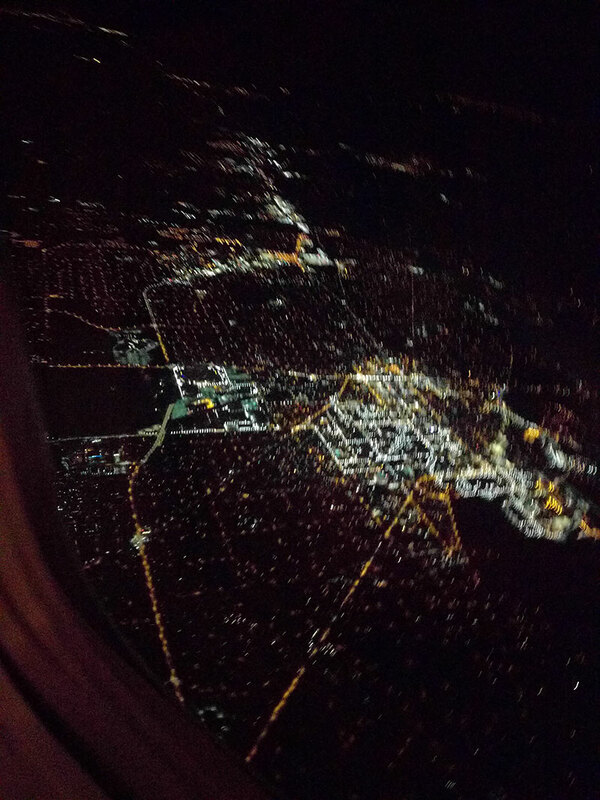 I looked out of the small airplane window to see the lights of a city as if I was God looking down on earth. I was overcome by a feeling of shame as I recognized my privilege. 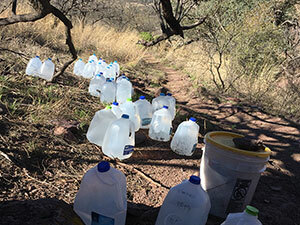 I spent a week “on the ground” learning about the experiences of migrants crossing miles of terrain on foot, which could take days or weeks, while I am flying 2,000 miles across the country in a few hours. Even as a person who yearns to understand their experience and attempts to feel the weight of their burden, I will likely never be faced with this journey. My hope for this trip was to mitigate my ignorance around immigration policy and to have the opportunity to share the reality of these issues that are often overlooked. However, if it has taken me this much effort to gain only a sliver of understanding, how will I have the power to alter current perspectives regarding this issue? Upon returning home, I became overwhelmed with feelings of hopelessness. I read posts on Facebook about the need for more militarization and those differentiating “immigration” and “invasion.” It felt like I was being slapped in the face. The “invaders” in these posts are people who I am trying to humanize with a face and a voice. How can people think that this week I just spent dissecting the ignored humanity out of immigration policy was a waste of time? Was I mistaken to think for just a second that there is hope for awareness leading to change? And then I was reminded of the fact that I did not get here by one convincing statement. Ignorance is bliss. And change is a process.  So, what I hope to pass on in this blog is a few points that you, the reader, can take to further your process of understanding. While there are individuals smuggling drugs or people into the United States, many immigrants are crossing the border for a better life. These individuals often do not want to leave their homes and families (especially those in from the LatinX culture) but they are faced with making a choice when their income is insufficient to support their families. Imagine yourself in their shoes, what would you do? Regardless of policy, no person should be treated as less than a human. 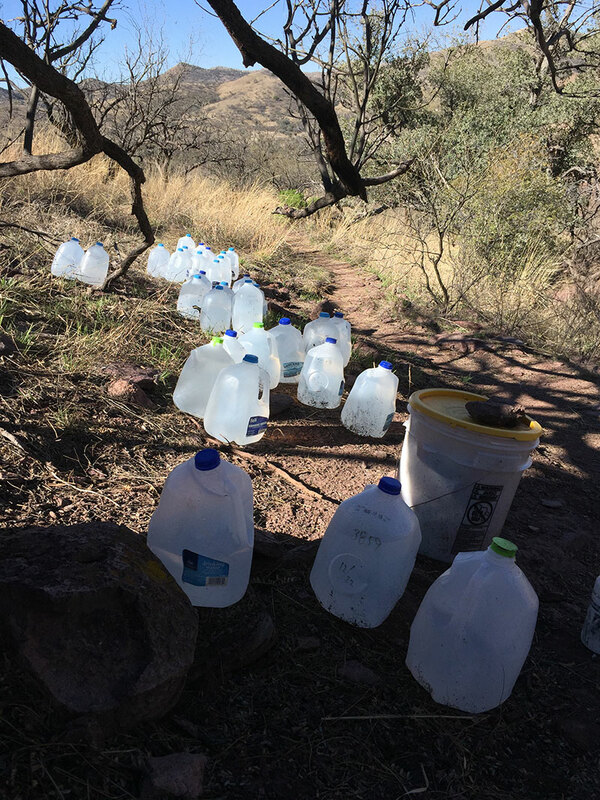 When an agent thinks that it is appropriate to slash the water jugs meant to save people from dehydration or when we refer to people as criminals and lock them in chains for a “crime” they committed as a sacrifice – there is a problem. Our immigration system is broken. It takes an average of five to seven years (can be up to 20) to legally immigrate to the United States. So, for those that opt out by saying “there is a right way” and “they need to wait in line like everyone else,” this is not a realistic approach to security for many immigrants. This issue is complicated and it can often feel daunting to challenge policies or ways of thinking that have been put in place as the norm. But for the next few days or weeks I hope you simply consider thinking about this issue through a different lens. I’ve had this problem in the past. I come home from a time away and someone will ask the very logical question, “ How was your trip?”. And I don’t know how to answer. A perfect example of this was when I returned from Peace Corps in Cambodia. For the first few months, my response to family and friends vacillated between an exhausted, almost apathetic acquiescence and a visceral frustration. I don’t expect to have that strong of a reaction from this journey – I was only gone for a week, after all; however, the question is still somewhat problematic. Why? Because good or bad, or even encouraging or disheartening, I failed to describe the complicated emotions this experience engendered. This was no silly trip. 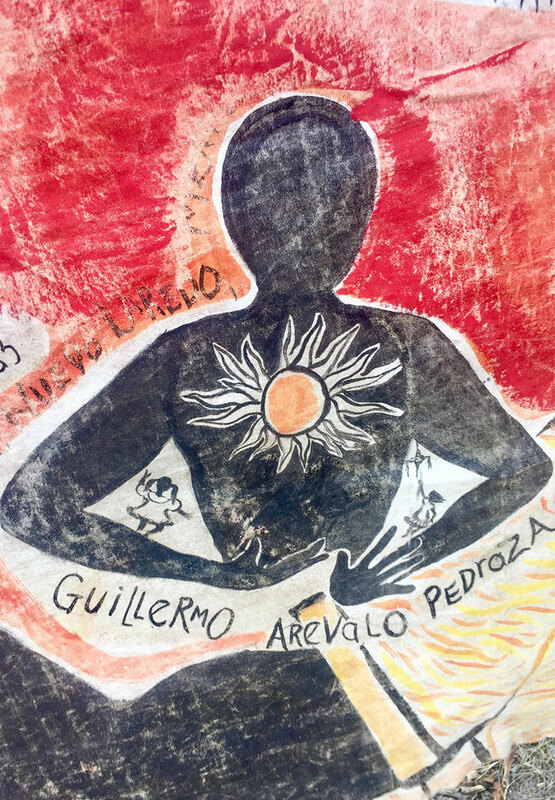 We met with lawyers and magistrates, border patrol agents, activists and artists, immigrants, students, community partners, and even the earth itself, seeking to understand immigration policy from all the key stakeholders’ perspectives. The individuals and organizations were all over the political and social policy spectrum – and even individuals within organizations varied greatly in their political leanings, ideologies, and personal intersectionality of identities. 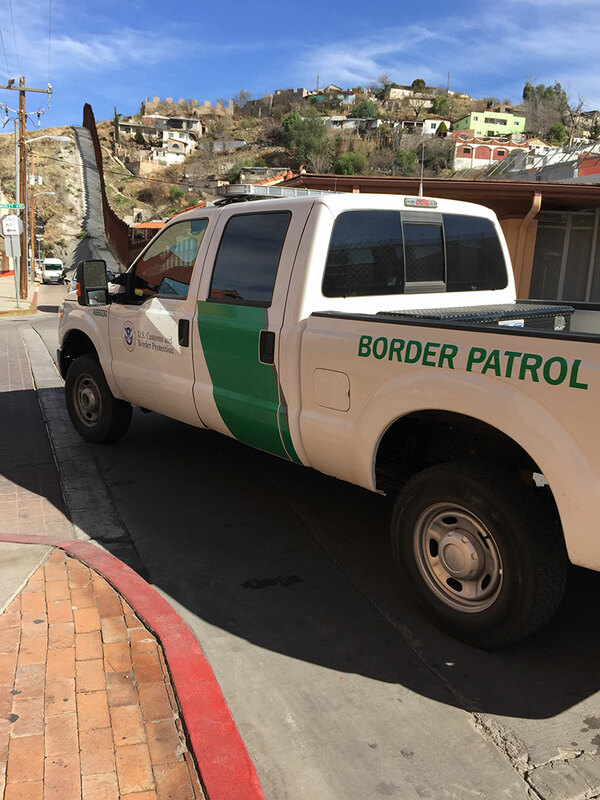 We met sympathetic border patrol agents – his supervisor who toed the line quickly replaced him, but still… they do exist – and we met pro-immigrant activists in favor of immigration policy reform, VISA reform. Most individuals, on both sides of the fence – excuse the pun – believe in their heart of hearts that the system is broken, antiquated, and desperately in need of reform. Needless to say, this experience much closer to comprehensive than I thought it could be – my default is skepticism too. It was intense and, at times, gut-wrenching. Watching detainees being sentenced to 180 days detention for seeking a better life for themselves and their families was particularly hard; however, there were also moments of deep humanity – a Mexican family connecting through fence on a Sunday afternoon, sharing a meal limited tough; a border patrol agent identifying with those he oppresses, and acknowledging it; and the work Bob Kee and AnaMaria do on a daily basis (see previous posts). All said and done, back in Michigan, I know it will be hard to sit in a classroom and divorce myself from our week on the U.S./Mexico border. So I’m not going to. I’m going to sit with it and continue to process it. I’m going to let it inform the rest of my semester, my program, and my life. As a policy maker, I’m going to keep the voices and perspectives of those we met with in my mind as I drive change and evaluate current policies. I’m going to let this experience change me for the better. I am quick to react to individual authority in a way that may be perceived as instigative, maybe even disrespectful to white supremacy. I study “macro” social work, and I struggle to forgive the individuals who play the game, who comply with the policies and rules that have abused, dehumanized, exploited, and killed those deemed “other.” Especially fellow white people who choose to disregard their own white supremacy, white privilege, and white fragility. My interpersonal skills are intentionally applied and vary between situations. I am a white woman who has forever been given the benefit of the doubt; I will use my privilege to push back, to force fellow white folk to see my white face staring back at them, not smiling or laughing nervously, not looking submissive, and necessarily verbally disagreeing with their oppressive speech and behavior. It is easy to see the world in black and white. I challenge you to stretch your mind. Attempt to think from a perspective other than your own privileged one. What are you doing in your life that might be enhanced by an increase in your emotional intelligence? Look deep down, how do you reconcile and justify calling someone “illegal?” Why do you believe that a migrant from Mexico who has come into the U.S. for perhaps the same reasons your ancestors came, is less deserving than you and your family? Do you believe that all laws are moral? Thank you to those who have followed us on our journey. I would love to hear your reactions to my blogs. 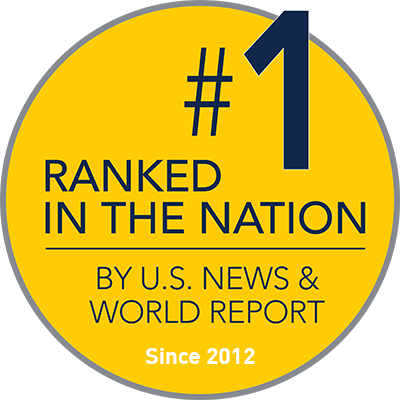 Please email me at carpol@umich.edu with questions and comments. I’ve been struggling to write this post because I know it means two things. First, it means that this incredible experience in Tucson is finished. Second, it marks the start of a lifelong journey for my classmates and I to serve as allies for those we have learned about this week. The progression of this trip that led to our newfound mission was quite beautifully laid out. First, we met the people on the ground who have already been working in immigration as advocates. Their reminder of confident persistence is one I will carry with me always. Second, we travelled to the wall and soaked in the enormity of its fence posts as well as the enormity of institutionalized violence. Third, we met with Border Patrol agents and toured the facility that contributes to the militarization of our nation’s border. The next day we watched the dehumanization and neglect of due process involved in Operation Streamline. We hiked a trail that past immigrants have used to cross the border, unable to fathom what that journey must be like for those desperate to make it. 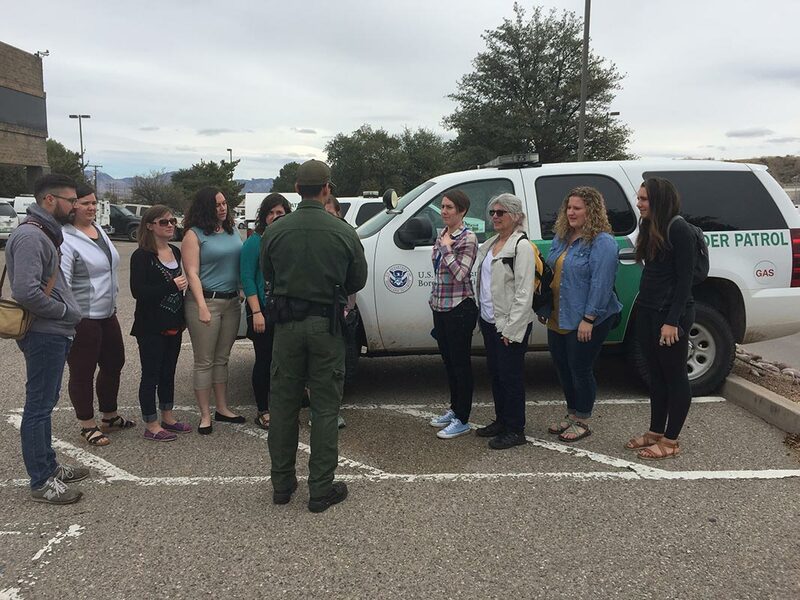 We ended our trip with a visit from the Border Patrol Victims network which brought balance to all of the previous experiences, reminding us of the unimaginable effects policy can have on our fellow human beings. I am overwhelmed with a mix of emotions. I am angry with the systems that allow teenagers to be shot through the wall and for individuals seeking hope and safety to perish in the desert. I am saddened by the rhetoric people use to label immigrants, fellow human beings, as illegal aliens. I am further drained by the sight of the border wall which to me seems an arbitrary structure built more for the perpetuation of oppressive and divisive ideologies than practical purpose. Despite all of that I am filled with such gratitude to those who permitted us to catch snapshots of their world. Our journey to Arizona has given me hope in ways I never expected, i.e. the smiles of a small child through the wall and the energetic words of advocates from all walks of life. Their voices will forever ring in my heart with messages of humanity, persistence, and passion for human rights. My classmates and I all know that the fight for justice in immigration will be a long-fought battle, but the people we have met this week taught us what is needed to keep fighting it. We hope that those of you reading this have learned something as well. 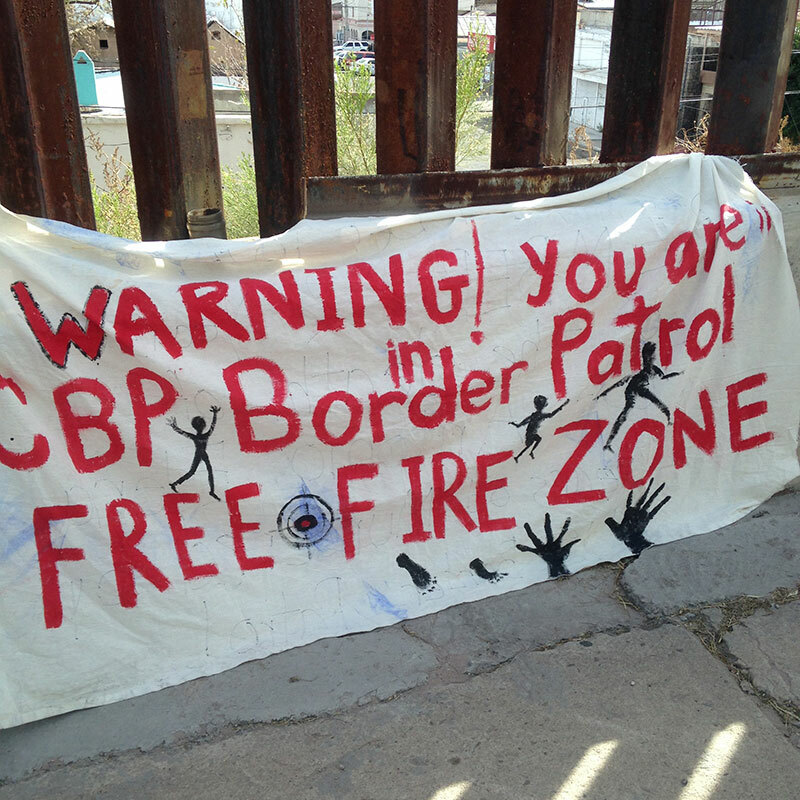 As stated by Ana Maria from the Border Patrol Victims Network, “It is never a waste to tell people what is going on. If you have two thousand people or just one person, make sure others hear you”. This won’t be the last that you hear from us. Upon returning home, when people ask me about this experience, I suspect that I will pause and say, “It was very powerful.” In that pause, many emotions, thoughts and sensations will flood my head and heart. I will think of the individuals I met, hands that I held, ideas that I challenged and stories that I shared. These experiences have and will continue to shape me into greater instruments of peace and justice. Immigration and border issues in this nation are polarized in both policy and practice. This polarization is exemplified in poor and incompetent federal policies concerning a foreign individual's lawful entry into the United States. The current visa programs used to regulate such migration are inadequate and inaccessible, resulting in the mass migration of foreign-born individuals that enter into the United States unlawfully, without documentation or the permission to do so. Now, if one thing this experience has emphasized for me, is that the current immigration system is controlled by the powers-that-be so far removed from the feet-on-the-ground and fingers-on-the-trigger. But regardless of the critical need for intervention, an alternative must be posed. Border Patrol agents, court employees and even immigrant activist groups are products of set system of power that is seemingly impenetrable. What alternatives do the products of a system have in making individual decisions concerning human rights or moral responsibility when disruption will be immensely costly to themselves and their own families? An alternative must be offered in replacement or repairment of the current visa program but I do not know how and what that alternative will look like. One thing I do know, is that whomever, wherever or however it comes forth, I will join in the fight and fight I will. Change must begin at the top and after meeting with the individuals and groups that I met with this week, I can confidently say that change is brewing. Due to internal policy combustion or external revolution, change will come. And I now have a responsibility to live a life devoted to this change. I cannot unknow the truths from my experiences this week. And I refuse to compartmentalize them into the “remember whens” or “in a few years…” The time for change is urgent. The time for change is now. Let us begin at sunrise. Sherrie has been working on questions related to immigration since she was in graduate school more than three decades ago. One of her first articles on this topic, “Playing Cat and Mouse at the U.S./Mexico Border,” was published in 1992. 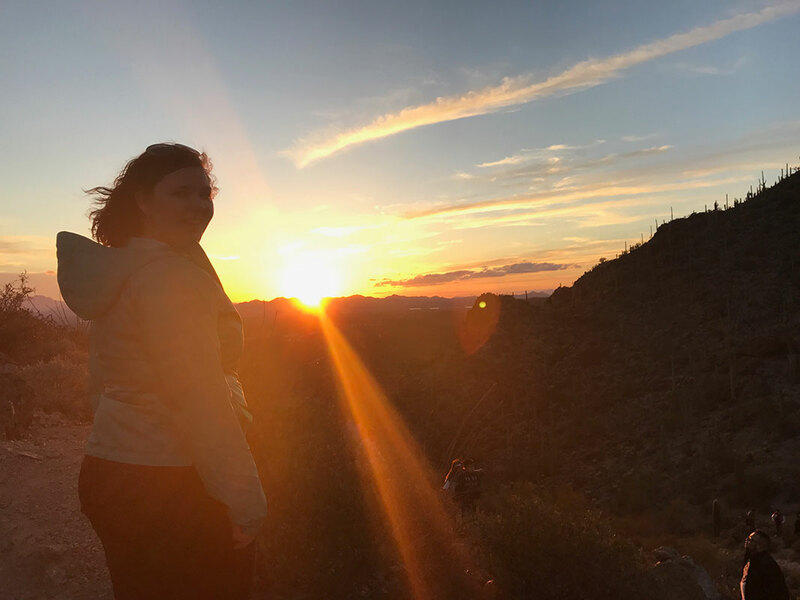 The game has gotten more dangerous since then and, on this spring break trip, Sherrie and her students will work to grasp a policy’s complexities at the highly contested Nogales, Arizona/Mexico border. We are back in Ann Arbor and even though the border is far away physically, I think it is not far from anyone’s thoughts. I recently realized that I have been taking students to the border since 2010 and I was there five times in the past year alone. Examining border issues over time gives one both a multi-layered perspective and an opportunity to learn—again and again. The idea of a wall at the border is anathema. But conditional on its existence, even its form is controversial. What are some arguments about its form? 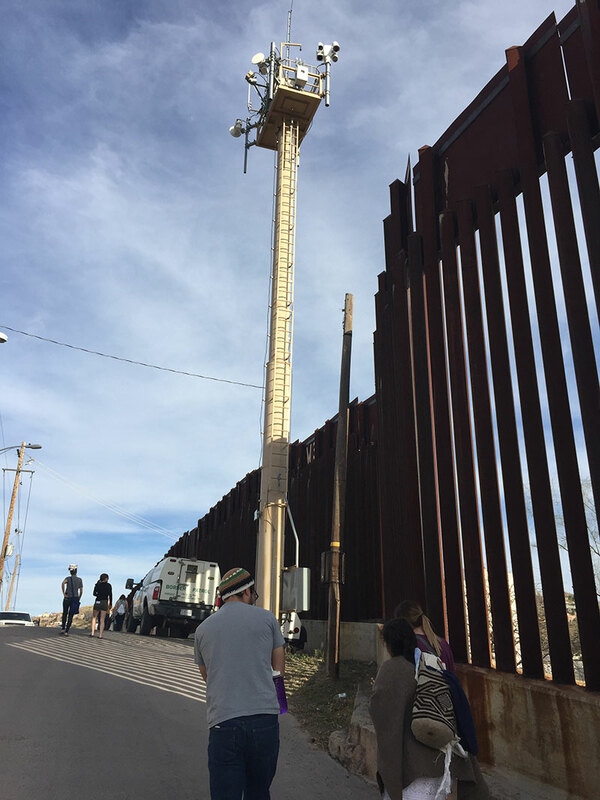 When I took students to the border in 2010 we were stunned by the tall ugly structure we faced in Nogales (see picture # 1). 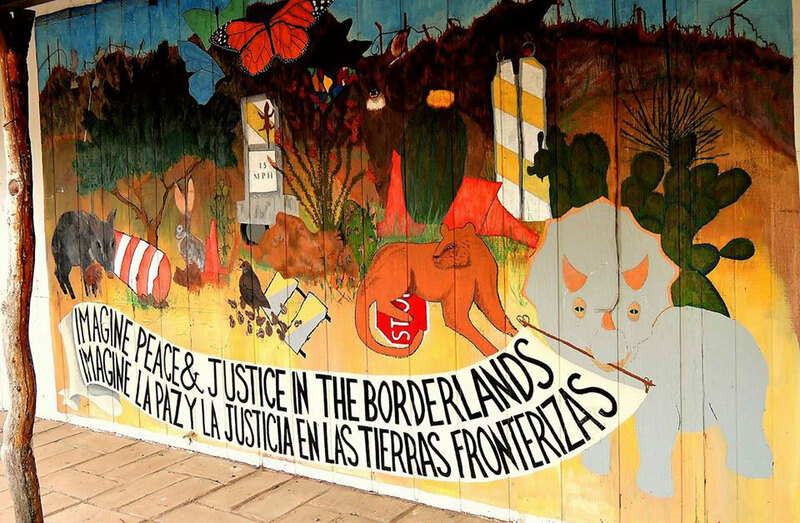 We talked with environmentalists and others who bemoaned the fact that the wall prevented conversations from the two sides of the border and the movement of animals, birds, and butterflies. A wall with spaces would be an improvement, they claimed. In 2011 a new wall was erected, with regular gaps between tall columns. 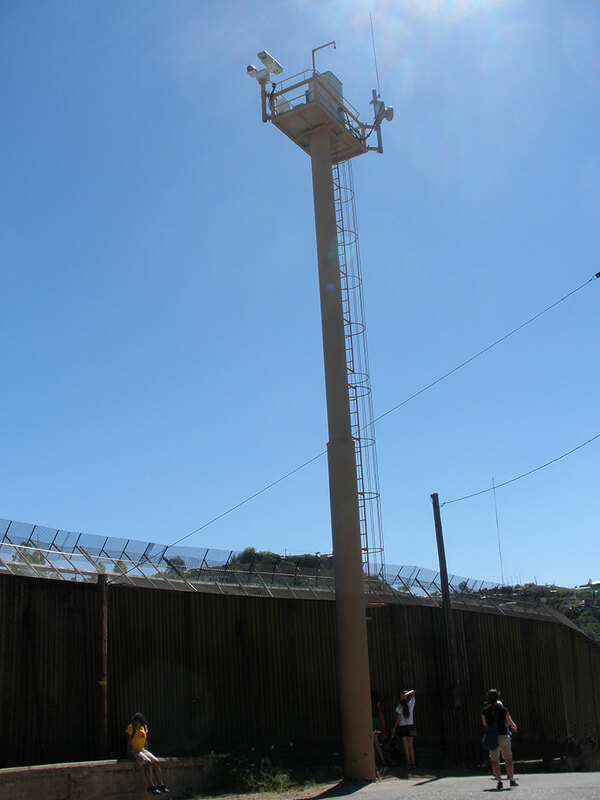 Border Patrol agents liked it better too and said it allowed them to see what was happening on the other side before, for example, someone jumped into the United States by climbing the wall. Last week, we met with an activist from the Border Patrol Victims Network who asked whether Donald Trump could make the wall solid again so that the Border Patrol can’t shoot people through it (see picture # 2). 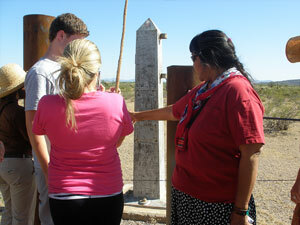 The Tohono O'odham sovereign nation spans the border between the United States and Mexico. 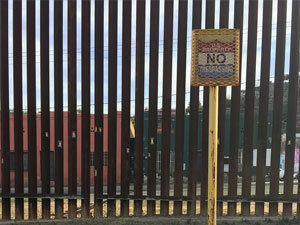 Right now pole and barbed wire fencing constitutes a border barrier through the nation. This fencing while disputed, and still a barrier, allows air to flow freely, permits animal grazing and migration, means that the Tohono O’odham can still walk on their lands, and provides an easy view of distances. The current administration is readying to build a wall across the rest of the border that is like the one that cuts through Nogales. And one of the top priority places to begin building it is across the Tohono O’odham nation (see picture # 3). To learn more read the NYTimes article "Border Wall Would Cleave Tribe, and Its Connection to Ancestral Land". 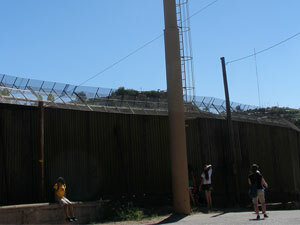 The border wall in Nogales in 2010. 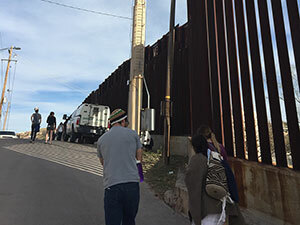 The border wall today (2017) in approximately the same place as the previous picture. The U.S./Mexico border fence that runs through the Tohono O'odham nation. The monument in the background is the official border as established by several treaties in the 1800s. Today, my students showed me the troll comments on U-M’s Facebook page in response to our blog. It’s a tough world and I know that many people will not agree with what we do. We would never respond to such comments. But I will carry one with me as an artifact of this week because it denigrates everything we academics do. It read, in part “Very little of what matters with respect to immigration realities, consequence,s [sic] and policy has much to do with a silly field trip to peek at the border.” How should we interpret this? That our “silly little field trip” has little to do with immigration? That very little of consequence happens at the border? To me, the most offensive part of the comment is that we came to peek. Nope. There was nothing quick in our examination. The students were so careful to observe border activities from many perspectives. Nor was there anything furtive in our observation. The students spoke to everyone, no matter their practical or political affiliation. There was no sneakiness in our game. Our questions were forthright and the people we met gave us genuine answers because we asked thoughtful questions. 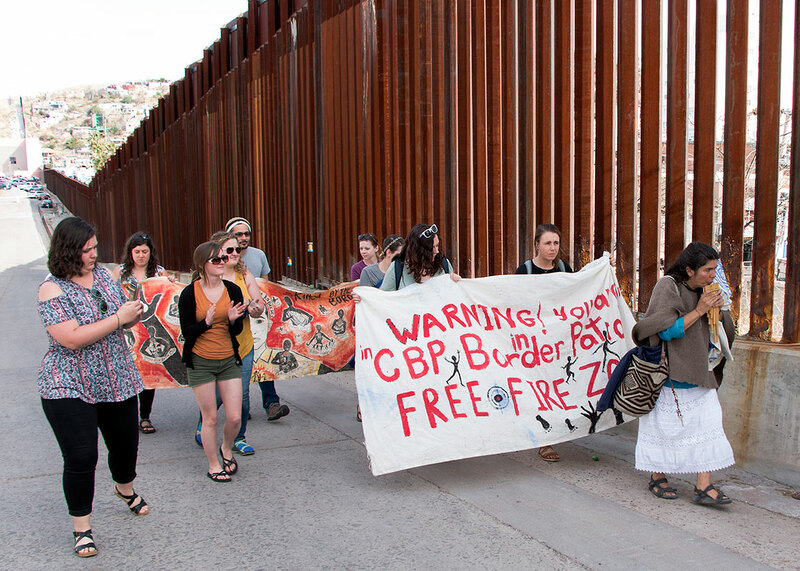 No, we didn’t peek at the border; we opened our eyes and gazed upon a wall that makes all of us less free. 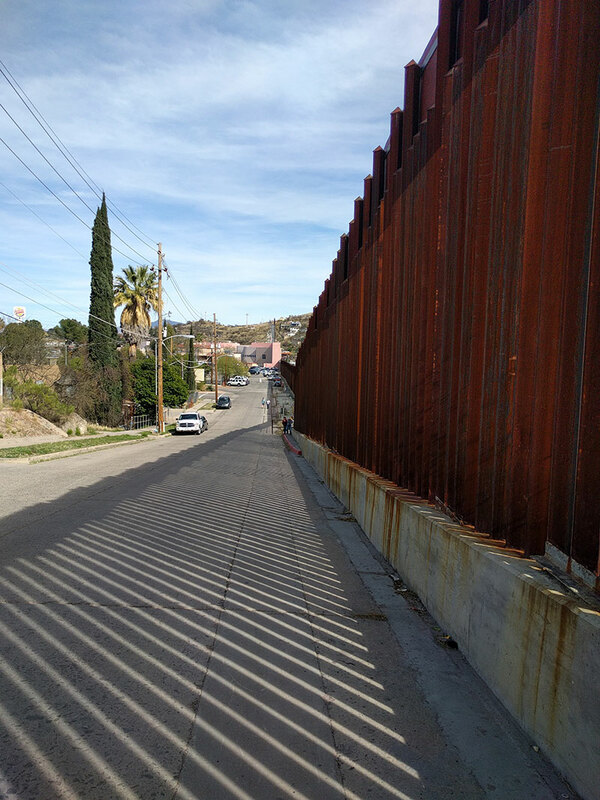 Looking at the reality of the border. It is hard to imagine how difficult it is to walk for miles in the desert day after day. 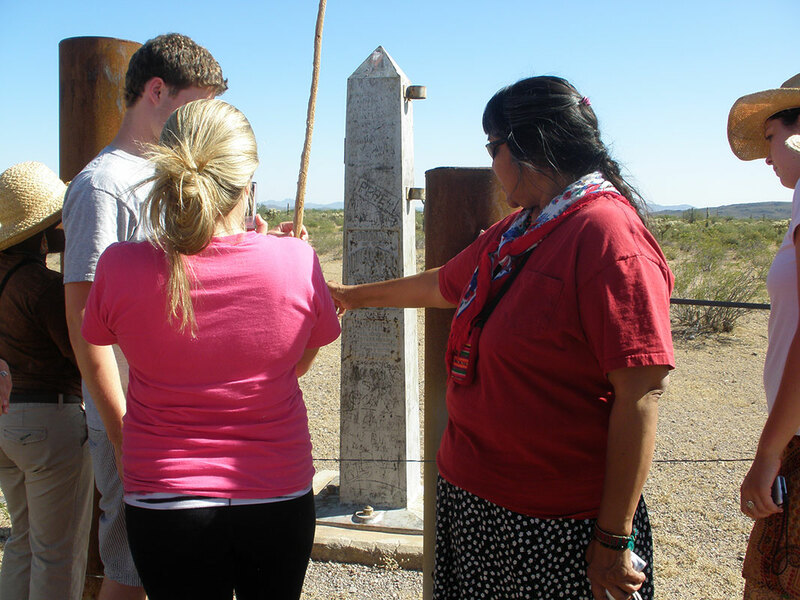 Today UM-SSW students will walk a canyon on a typical trail used by people coming to the United States. They will walk four miles to the border and leave the packaged food we have prepared. Then they will walk four miles back. It will take them about six and one-half hours. Read their blog posts from Day 4 to view this journey from their eyes. Examples of food bags left along the trail. Water left along the trail. Social scientists often talk about the importance of time series data. I have attended federal court sessions of Operation Streamline (OS) for almost a decade. In that time, numerous litigations have transformed it from the gut-wrentchingly cruel and inhumane to merely cruel and inhumane. At the beginning OS was a judicial spectacle—a magistrate addressing, declaring guilty, and sentencing 100 orange jumpsuited and shackled defendants en masse. Today they wear their own clothes, handcuffs and leg irons to face a kinder, more gentle, magistrate who questions each defendant individually and asks carefully whether they understand the charges against them. But the outcome is the same. 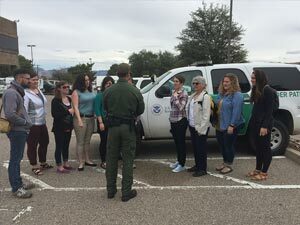 While at the Nogales Customs and Border Patrol station today, I was struck by the similarities between people trying to talk across political parties and U-M students trying to talk with border patrol agents. Conversation across the divide is difficult but it can be done. One way that we change minds (or learn more) is to have respectful and real conversation. It isn’t easy. And it isn’t perfect. But it is better than allowing the gap to widen. I ask my students to strategize about how best to pose their questions. Think twice-then act. Who can you talk with about a difficult and divisive topic? How can you approach a conversation about a contested issue with someone you don’t know? 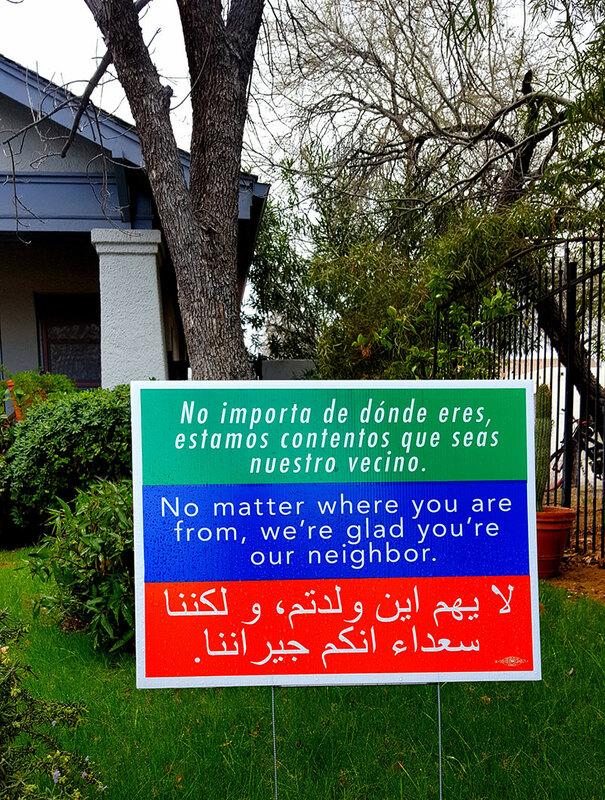 What if you started with a divisive topic like immigration? Is there any common ground that you can use as the foundation to further conversation? How do you have a conversation when you fundamentally disagree? Today we went to the border to encounter the wall. As an instructor, I grapple with the difficult things I ask my students to do and the expectations I have of how they will then proceed. How do we act as witnesses to the consequences of the wall without making our experiences exploitative? Last year, students felt there was a taint of voyeurism to our process. So for this year’s journey, I worked to change our pattern of behavior, alter our processes, and change my own participation. Before we left today we struggled with the issue of non-voyeuristic witnessing as a group. The students raised so many thoughtful points that it was clear they have thought about these issues more than I knew. None of them, however, raised the one issue I have always had (and avoided dealing with): The wall is an inherently exploitative barrier and to even view it from our safe vantage point reinforces the power of its presence. Power disparities create spaces for the powerful to build walls and our position of power allows us to view the wall safely. Tucson, about 65 miles north of the U.S./Mexico border, is a border city. 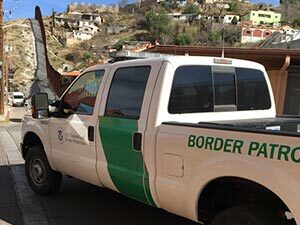 It hits home when you arrive at the airport and immediately see the ubiquitous green and white trucks of the border patrol. When driving south on the highway from Tucson, you’ll pass many more border patrol trucks, be photographed by the high resolution cameras dotted along the highway and hillsides that send real time videos to the border patrol, and stop at the border patrol check point on I-19 (where every single car is checked). The virtual fence makes its presence felt closer to the border.  Video feed towers, movement towers, stadium light towers, and drones all check your progress. Ann Arbor, about 37 miles west of the U.S./Canada border, is also a border city. And it is far closer to the border than Tucson. And yet, no one notices. Why do you think the northern border is treated so differently from the southwestern border? It is a fact right now that being an immigrant in the United States means your life is at risk. New immigration policy is being created solely as a result of executive orders from the president and enactment memos from the Department of Homeland Security, an executive branch. Learn more at the Executive Orders on Protecting the Homeland webpage at dhs.gov.